By Elaine Yao / Feb. 15, 2015, 3:25 p.m. In Harbin, in China’s northeast, heavy smog has become a fact of life. As the bitterly cold winter sets in, coal-fired power plants across China’s “Ice City” ramp up combustion to heat homes, power construction, and produce electricity. Smokestacks belch an acrid concoction of soot, sulfur, and countless other ingredients categorized as “particulate matter,” blanketing the city in choking darkness. As visibility falls to mere meters, traffic grinds to a halt, flights are delayed, and schools close. Despite the white masks that many residents sport, the smog fills lungs, and penetrates arteries. 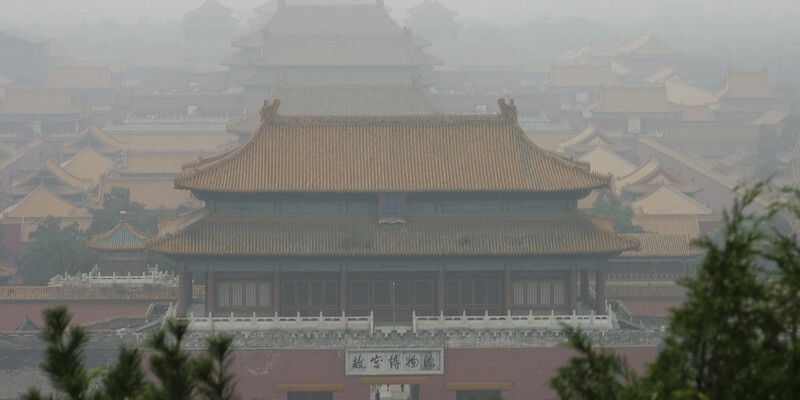 This was the scene in October 2013, when Harbin’s levels of fine particulate matter were fifty times the World Health Organization’s recommended maximum. These levels of pollution have become a common sight in cities from Harbin to Shanghai in the distant south. China’s air pollution has enormous consequences: in 2010 alone, respiratory ailments were estimated to have cost China’s population of 1.3 billion an estimated twenty-five million years of healthy life. In 2014, an international group of world leaders and economic experts assessed the economic impact of pollution-related premature deaths at 9.7 to 13.2% of GDP. Pollution has become a common topic for Chinese bloggers and international journalists. As the environmental impact of rapid industrialization generates attention from both Chinese citizens and the international community, it’s become closely connected to China’s growing international dominance. If the governing Communist Party of China (CPC) continues to disregard mounting concerns over pollution, it may continue to achieve economic success. However, the party leadership intends to present itself as a secure, responsible government that’s capable of responding to its environmental challenges while achieving its economic goals. With the understanding that global leadership in the twenty-first century requires more than economic success, the CPC has resolved to match its economic advances by becoming an environmental policy trailblazer, in hopes of proving it can be a conscientious and effective modern government. China is looking towards a cleaner, more mature economy to build a wealthy modern society it can sustain well into the future. Recognizing that cheap labor and mass manufacturing cannot indefinitely produce growth, China is undertaking a high-stakes transition that involves radical economic restructuring and the development of green technologies green development. Building a more energy- and resource-efficient market economy hinges on moving towards greener energy sources. During its industrial infancy, China’s massive domestic reserves of coal gave it the energy security it needed to become a manufacturing powerhouse, fuelling a veritable coal addiction. Reliance on coal shaped the development of China’s energy infrastructure. Today, China produces nearly 70% of its energy from coal, and still accounts for about half of all the coal consumed worldwide. Yet recently, coal has become the enemy in China’s battle against pollution. Coal-fired power plants are the main culprits responsible for the sulfate, nitrate, and fine particulate pollution that darkens skies in cities like Harbin and causes an estimated 250,000 premature deaths every year. Despite huge government efforts to prop up green energy, the transition away from coal is certain to be slow and difficult. Energy is the crucial ingredient to building the glittering cities that have come to symbolize China’s new wealth, and in China, energy still means coal. In recent years, China’s efforts to reduce its economic dependence on coal have been further tested by its unexpected economic slowdown: in October, its GDP growth was 7.3%—the lowest in five years, and far from the double-digit growth it enjoyed in the first decade of this millennium. As economic growth has slowed, so has China’s energy demand. This might have been welcome news to environmentalists, but it’s been a nasty shock for Chinese and international coal producers, who counted on skyrocketing Chinese demand well into the future. Now, they face a global oversupply of coal that’s pushed down its price to nearly one-third of the price reached during the “energy crisis” of 2008. Private industry in China is dominated by national state-owned enterprises (SOE), giant state monopolies that enjoy both significant market power and political power. Despite recent efforts to break up large SOEs, which have been accused of inefficiency and stifling private innovation, SOEs enjoy secure political connections and access to financing from state-owned banks by virtue of their public ownership. Thus, government actions typically mirror industry interests, complicating the effects of market crises such as the global coal glut. At the helm of China’s macroeconomic policy is the National Development and Reform Commission (NDRC), which faces the challenge of reconciling long-term economic restructuring policies with the short-term stimulus measures needed to boost China’s slowing economy. It’s also responsible for planning an economic development path that’s less resource-intensive and polluting. The global coal glut is threatening these efforts, especially as China’s struggling coal industry, to which the fortunes of millions of people and entire provinces are tied, leverages its embedded central government connections to obtain financial favors. These internal political challenges may well determine China’s success in its campaign against coal and pollution. The outcome will be key to determining if China can build a sustainable modern economy that will support its efforts to establish itself as a major player on the international stage. In the barren provinces of northwestern China, mining is a way of life. The inhospitable, sparsely populated landscape is interrupted only by crammed industrial cities built on coal profits. Unsurprisingly, they are some of the most polluted cities in China, earning monikers like “China’s Chernobyl.” Ash from coal mining, manufacturing, and transportation fills the air and the water, through which it becomes absorbed into the soil, destabilizing buildings, ruining crops, and sickening livestock. For decades, small, unregulated mines sprung up rapidly to meet soaring coal demand, a ubiquitous reminder of China’s rapid economic development. Today, they’re tied to the livelihoods of millions of people, and are impossible to disentangle from local governments and financial institutions. Shanxi, China’s largest coal-producing province, produced 797,450,000 metric tonnes of raw coal in the first ten months of 2014 alone, equaling some twenty-two tonnes for each of its 35,712,111 residents. Its coal producers are in dire straits, however. Weakening Chinese demand for coal, coupled with domestic and foreign oversupply, have caused coal prices to drop—24% in 2014 alone. Chinese coal producers say they simply can’t afford for prices to drop any further—70% posted losses in 2014—and are looking for the NDRC to help lift prices. With millions of domestic jobs and entire provincial economies at stake, the NDRC has no choice but to keep the domestic industry afloat. Following straightforward economic logic, it’s ordered the largest, national state-owned mines to cut production by about 10%. Smaller mines, which have the worst history of overproduction, inadequate regulation, and poor safety standards, haven’t been so lucky: they’ve been ordered to shut down completely, or have been merged into existing large state-owned mines. Consolidating the industry and phasing out diffuse, problematic small mines makes sense to the NDRC, but it’s not popular with mining companies, or provincial governments who depend on coal for their fortunes. High-ranking coal company executives are often appointed to top government posts, generating an extreme case of regulatory capture, where the lines between industry and government are indistinguishable. In a province where “official corruption” is the norm, and neither the people nor the government are willing to sacrifice their jobs and incomes to suit the whims of the state, resistance to industry restructuring is strong. The steady stream of ambitious new policy announcements from the NDRC that promise closures, production cuts, and safety and environmental improvements have begun to yield some results: China’s annual coal output appeared to fall for the first time in fourteen years, by about 2.5%. In 2009, China took the world by surprise by becoming a net coal importer for the first time in its history. A variety of circumstances, including domestic transportation bottlenecks, industry consolidation, and the global financial crisis, contributed to the switch. For many, it was difficult to understand how a historical net exporter with nearly a fifth of the world’s coal reserves would need to import coal. Nonetheless, it only confirmed that China was no longer an isolated manufacturing exporter, but a full-fledged participant in international trade, whose actions would increasingly shape trade flows and market prices across the world. Major coal-exporting economies heralded the news as the beginning of a decades-long ‘super cycle’ of surging global demand, driven by rising imports and ramped up production. Their enthusiasm was premature, however: both Chinese and foreign producers expanded capacity at the same time that China began to move away from coal, causing the global price to collapse. This spells trouble for domestic producers that are struggling to compete with more competitive overseas prices. On top of consolidating the home industry to reduce excess capacity, the NDRC has begun to target foreign coal in an effort to balance supply and protect domestic jobs. In September, China announced that it would ban imports of low-quality coal with large amounts of impurities beginning in 2015, and reduce coal imports by fifty million tonnes by the end of the year. International commentators noted that while the move (which was announced prior to the UN climate summit that year) was purportedly aimed at reducing urban air pollution, it seemed to have much more to do with protecting the domestic coal industry from foreign competition. Tellingly, domestic power plants faced much less stringent quality standards. Less than a month later, China explicitly began reintroducing import tariffs, while cutting export tariffs. Imposing tariffs to protect domestic industries, which is discouraged by the WTO, is a desperate move at odds with the market mechanisms that Chinese policymakers have claimed to embrace. The NDRC’s actions haven’t gone unnoticed by other countries. Australia in particular has been hard-hit, and has made no secret of its anxiety. Its mining slowdown has already caused mines to shut down and thousands of workers to lose their jobs, crippling the boom towns which grew to satisfy high Chinese coal demand. Glencore PLC, the world’s largest coal exporter, closed Australian mines for three weeks over Christmas in an attempt to ease the global glut. In order to cover high fixed costs, many miners have no choice but to continue shipping coal. Coal’s long-term outlook in Australia is bleak, which is dire news for a nation whose economy is heavily reliant on natural resource exports. While China’s actions make internal sense, Beijing hasn’t acknowledged the international impact of policies like its heavy-handed tariffs. Since Xi Jinping took power as China’s president and general secretary of the CPC, he’s promoted the “Chinese Dream,” a slogan urging China to reclaim its role as the dominant global power and attain the national glory it had once possessed. The slogan is ubiquitous, tacked on billboards and flyers, plastered across bus stops and echoed in television advertisements. It’s a sort of government-generated call for individual aspiration and industry, layered with promises of national rejuvenation and prosperity. The CPC knows that to become the global leader it envisions itself becoming, China needs a new strategy for growth that’s as sustainable and efficient as it is ambitious. Beijing has devoted billions of yuan to renewable energy subsidies and grants, becoming the world’s largest renewable energy investor and producer. It has strengthened its Ministry of Environmental Protection, and revised its environmental laws. It’s publicized its ambitious goals through high-profile international agreements and announcements, most notably the historic bilateral deal with the United States at the Asia-Pacific Economic Cooperation (APEC) summit in Beijing last November. Among the State Council’s list of targets outlined in the 2014-2020 Energy Development Strategy Action Plan is reducing coal’s share of the distribution of energy sources to 62%, and ending the construction of new coal-fired power plants by 2020 (the end of the thirteenth five-year plan period). This is welcome news for those alarmed by the rampant environmental degradation that has plagued China’s industrialization. But coal remains a sticking point. Despite efforts to consolidate China’s sprawling coal industry and cut its reliance on coal through the expansion of alternative energy sources, the challenge of the unforeseen economic slowdown and global supply glut are testing the NDRC’s commitment to reform. Perhaps more importantly, China’s internal political structure, including its stubborn provincial governments and powerful state-owned private companies, limits the effectiveness of the NDRC’s policies, no matter how good its intentions. China’s limping coal industry may have powered its economic ascent, but it’s now more of a liability than a boon. With mining companies and power companies so deeply tied to the state, it’s unclear where the drive to meet Beijing’s lofty environmental goals will come from. For a world counting on a cleaner and more responsible China, that’s cause for concern.